The baby stuff is slowly starting to show up in the house now… We have a wicker bassinet in our bedroom (a family heirloom on Brandon’s side), a Jenny Lind cradle in the living room (that my little brother and sister slept in), the new Eames rocker, and a few other big items. I can already tell it’s going to be a challenge to keep my house from being taken over by primary colors and plastic! I was a little worried that the rocker would look funny being in such close proximity to our IKEA Eames/Nelson derivative at Brandon’s desk, but it looks fine. And the cradle, as big as it is in our small living room, looks fine too. I actually really like having an item in the room that definitively says “baby” — Brandon and I are so excited to meet her! amazing decor – i love it!! It’s so refreshing to see a cradle fit in nicely with the existing living room decor. Fight the primary colored plastic! I’ve been following your blog now and, as a mom, I’ve enjoyed seeing your nursery develop. I love your taste and especially love the actual use of the picture rail to hang your prints! Great work and have fun with the new baby! Little ones make life so great, wouldn’t you agree? Any chance you can share where you got your white coffee table. I have been looking for something exactly like that! You do pink so well. I love how everything just…flows! I was wondering where you got your tv stand/console, I love it! Is the crib over and air-intake vent, or is that a heating vent? wouldn’t want little girl to get too too hot while sleeping. Love the pillows! Where are they from? it all looks great to me. it’s so fresh and warm. i’m also wondering about your tv stand/console. it’s exactly what i’ve been looking for! I have a vintage crib, too. I use it for a few months until my babies start being able to scoot themselves around–I’m just too freaked out by how not up-to-code it is. Anyway…I am a long-time lurker and LOVE your style. I feel sooo guilty! I read your blog all the time but this is my first comment. I LOVE your house. If your ever in the Dallas area stop on by I could use some pointers. Congrats on the new baby. I was just curious where you got your coffee table at. I love it! Where is your sofa from – I love it!! I didnt buy any baby furniture yet! and I m due May 9th! …. i love your living room… really cozy! Sources… The coffee table was by Thomas O’Brien for Target, and the TV console was from west elm. The sofa is from Room and Board (Jasper), the picture rail cord is from Rejuvenation, and the pillows are from Hable Construction and Thomas Paul. The cradle is over an air intake, not a heat vent, so no worries! I just love your living room and I think that the wicker cradle looks darling! Where did you find all of the neat, round “flowery things” that fill the vases in your home? There’s a vase I’ve been eyeing at Target and some of those plans/flowers/gorgeous little objects would look PERFECT next to the Entertainment Center in our living room! Awww, your living room is simply lovely! I too, am expecting a baby around the end of July, and i share your desire to keep primary colors and plastic from taking over my apartment! I love your style. I have a year and a half year old and she has completely taken over the decorating with all of her stuff! I hope you are able to keep up your style better than I did! your home is so lovely – but then again, with your style, i wouldn’t have expected anything less! I love everything, especially the pillows! Wow! such amazing and elegant design. I love it.So cool and clean! So pretty and soft. I love the pink. I love the ‘Panoramic’ function on my camera…it makes my interior shots look so much more interesting and professional!! I never thought of putting a cradle in the living room – I should just put her actual cradle out here because she still never sleeps in it!! ;) Little girls are pretty special, I can’t believe mine will be 6 months this Saturday! Good luck with the last couple months!! BTW – do you have a Moby Wrap yet? They’re a life saver!! I was just wondering if you could post some of your links for wallpaper buying? I’ve looked at Velocity and Walnut Wallpaper, but they’re a bit more expensive then I want, for a DIY project of making scented drawer liners. However, I love their style! I’m looking for floral prints. I tried etsy but also didn’t have much luck there either. I appreciate any insight you can give on this topic. Everything looks so homey! I love it, it’s such a comfortable room. You two must be so excited for the baby to come now so she can be rocked in that great chair. I LOVE your home! It is soooo beautiful! Looks gorgeous! What sort of plant/flower is that beside your TV? I haven’t really seen anything like that around where I live (Australia). HI just absolutely gorgeous room….best of luck !!! This is lovely! I like how you have incorporated family memories. Good luck with the rest of your pregnancy and the delivery. I will be interested to see your wonderful abode in a years time. When the baby is mobile. All my lovely things, have been banished to the closet for the next 3 years I think. Love your room! I am 7 weeks pregnant now, and I already want to set up everything. But it’s kind of hard to do anything without knowing the gender. You are so inspiring! Love all the pink! oh how your world will change! when our daughter was born (almost 21 years ago) it was like we went from seeing the world in black and white to seeing it in technicolor. she’s the best thing that ever happened to us. Don’t worry, you will love that baby so much, even more than you love your beautiful house, that you will get used to the plastic, primary colors that will take over. SUCH a cute room! so warm and welcoming. So very excited for you about this little baby!!! Your home is the perfect blend of comfort and beauty, something which is hard to come by! I love your style, and the way that you can blend such a rich palette so well; grays, pinks, browns and oranges all come together so sweetly and in a manner which is obviously universally appealing, since I am one of your many, many admirers. It’s so lovely to look at your pictures. And I’m happy to see you incorporating baby things into your home. I’m a mom of two young ones, and here’s a little advice: don’t buy it until you need it. No slings, wraps, boppys, activity mats, etc. etc. etc. I wish I had all that money back! Just wait and see what you & your baby need. You live in Chicago, there’s NOTHING that you can’t get the same day you need it. I moved from Lincoln Park last year and MISS my city so bad. You know what you need first day home? FOOD for the adults; someone to hold the baby when you shower; thank you notes; and someone to start doing laundry. Every thing else can wait. Good luck and please keep posting your DIY series, I’m loving it. The green things in the vase are supposed to be chestnut branches (I just like the round spikiness of them!). Amanda, unfortunately wallpaper is often expensive. Walnut wallpaper is my favorite place to look, and you already know about them and Velocity. You might have some luck at Target – they’ve been carrying some wallpapers lately for around $40 a roll. Anna, the rug is by Madeline Weinrib, and I bought it at ABC Carpet and Home in NYC. Is that an Imperial Walker I spy? Good luck keeping the tacky plastics at bay…it can be done! I am so impressed with the thought you’ve put into every detail of your home, and to watch it all come together has been a total inspiration to me! My name is Heloisa, I´m a brasilian journalist. Well, first of all I want to congrats you about your blog! It is really really nice and well written! Second, I want to ask you for a favour, if you can, of course. I really love the design of your blog, and wanted to do a similar thing on mine, too. Can you pass me the information so my webdesigner will be able to do something similar? I´ll give you all the credits, that´s for sure! Do you like your Jasper couch? Is it comfortable and holding up well? Do the cushions have removable covers if you have to clean them? I have been looking at the Jasper for a while now. I am really nervous about making such a big important purchase over the internet without seeing it/ sitting on it first, but the sofas available where I live just aren’t cutting it. WOw! Looking FAB. But of course it would. another source question. I love the artwork above the sofa. Where is it from? Thank you for posting. I love it!! I love the zigzag carpet. It was a fuzzy white one before, wasn’t it? What a well-put-together space! I love your taste! It has the perfect balance of looking stylish yet comfortable. I am not a fan of unapproachable design, but yours looks so welcoming! I love that rug! I am decorating a nursery in vintagey reds and that looks perfect! Care to share where it’s from? Good luck to you! I’m looking forward to reading more about your journey! What color/kind of paint did you use in that back room? The light-medium brown/gray color? It’s exactly the color I’m looking for! Gah! I absolutely LOVE your blog, so happy to have discovered it! But I have a question for you – does your paint colour have a hint of pink in it, or is it just white (and maybe the curtains are giving off that glow?)? So beautiful, warm and welcoming – yet still modern. Great design! My goodness what a beautiful room. Well done Nicole! I just found your blog and absolutely love it! I have two children under the age of five and I can tell that instead of fighting child decor, you will embrace it. I have loved putting together a comfy, pretty home that the whole family enjoys. Would I have put a giant, fleece covered bean bag on the living room floor before kids? No, but they love it and use it and if it’s covered in the fabric I want, it actually looks pretty good. Things will change, but it will still be lovely. I’ll definitely be visiting this website frequently (especially now that Domino is done:( Thanks so much! Wow! How cute. It was worth the wait. i heart your blog! you are very creative! Coral, yes the couch has held up well. I’d recommend it to anyone! Michelle, the art above the sofa is a quilt that I put over stretcher bars. It was from Dream of Stars. The rug is by Madeline Weinrib, and I bought it at ABC Carpet & Home. 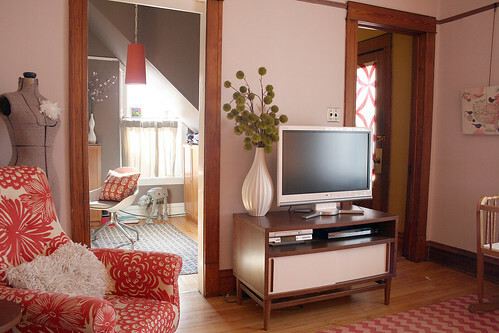 The living room paint is indeed a very pale pink – “Wild Aster” by Benjamin Moore. Brandon’s office is “Driftwood” by Benjamin Moore. really, really, REALLY lovely. i want to move in. is that creepy? I love your rocker, its so hot! Much better option then the typical slide rocker everyone gets, yuck! “Driftwood” is one of my Benjamin Moore favorites. Will have to stock up on picture cord. Did you just connect a single length on the frame hardware and wrap it around the picture rail hook? It’s a much cleaner look than the usual big loop. YOUR PLACE is looking quite nice…you have great design aesthetic. The carpet is the best!!! I’m not saying anything that plenty of folks haven’t already said here, but your home is AMAZING! The little touches of ‘baby’ that are popping up are just perfect with your existing designs. The cradle and the rocker are the perfect blend of warm and homey + clean and sophisticated. simply heavenly! What kind of picture railing hangers are those? I need some immediately. Thanks. I’ve been reading your blog for a while. Just love your style and designs. I’m a designer also and I was hoping to meet you at Blissdom this weekend, but never found you! Bummer. Hope you had a great time and good luck with the new baby:-) This room is gorgeous!!! Ikea rocks. I’m so in love with the rug! great job! You’re one of the reason that I’m still crazy about Madeline Weinrib’s rugs! I didn’t realize that you could order them in various colors other than what is on their site. 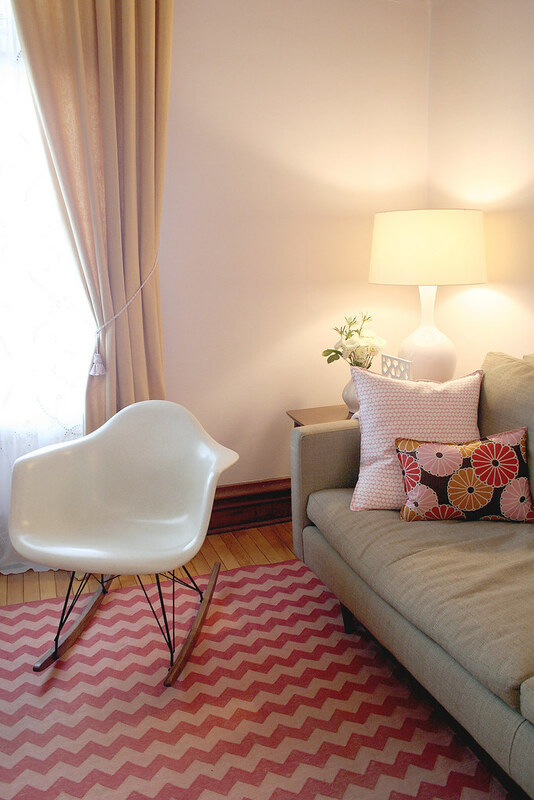 I did get lucky enough to pick up a pretty pink MW rug from another home blogger and I’m in love with it. But, it’s just made me want more! I’d love to see them all in person. I may just have to fly to NY! Good luck with the primary colors and plastic dilema– I have 4 children (age 1,3,6,9) and I think I lost control of the “desorating a long time ago. Your home is absolutely beautiful. Perhaps you will be better at keeping it that way than I was. I think it all looks absolutely gorgeous and congratulations hun! 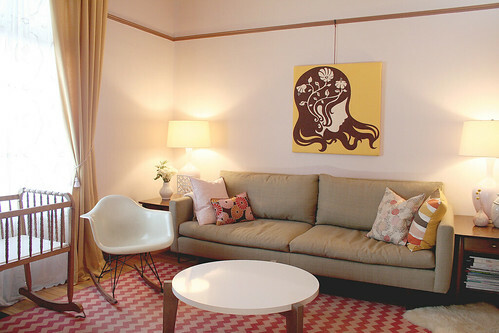 what great taste you have–i love how you’ve decorated the room and kept it chic and calming. just lovely! PS- have you seen that Target is now selling a knock off of the Eames rocker- its weird! Where did you get the great vase and green flowers by your tv? I love your decorating style. Is that the natural rocker or the white?